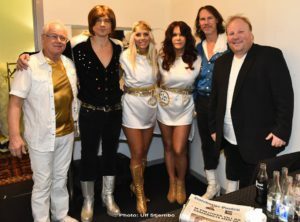 The Swedish Radiostation Radio4U in Skåne, did a long interview with the front artists (Staffan, Madelene, Lalle and Vicky) of ARRIVAL from Sweden on December the 17th, 2016. During the period November 17 to December 18 ARRIVAL from Sweden did the Christmas Show ABBASOLUTELY with ABBA Musician Mike Watson in Malmö, Sweden ! 10 SOLD OUT shows!!! Huge success!